One more short week at work before my long Christmas break started! It was still a busy week between getting ready for family Christmases (gift wrapping, baking and cooking), my work’s holiday party and my parents coming down for a visit. But let’s get into my workouts for the week! Back at it with weights and spin class tonight! I'm so glad I was able to make it spin class since there's no class for the next two weeks due to the holidays. Some nice, easy treadmill miles after work while watching an episode of Reign (the series I’m currently working my way through on Netflix). Not feeling the greatest but managed a couple of easy treadmill miles. And then curled up on the couch and relaxed! Started off my Christmas break with weights and cardio! It's so nice to use the apartment gym when it's not busy. Yoga by the Christmas tree this morning while Vinnie napped and then I stopped at the gym for some cardio before grocery shopping. A nice, easy run this morning before a busy day. I had to take a couple of walking breaks but overall it was great to be running outside! A nice easy run along the Mississippi River with some freshly fallen snow along the path this morning. Since giving you a look at how I eat when I’m working from home, I wanted to give you a look at how I intuitively eat on a cross training day. The day I chose was this past Monday, and Mondays happen to be the more intense of my cross training days because I do 90 minutes of exercising. About 30 minutes of strength training and an hour long spin class. According to my Garmin, between the exercise I get and the amount walking I get in on a typical Monday, I burn as many calories as my long run day! Of course, I get a lot more non-exercise steps in on Monday (between walking Vinnie, being at work and taking a lunchtime walk, I have at least 9,000 steps before working out) and I’m pretty low-key on Sundays besides my long run. So keep in mind that I’m eating more because I’m pretty active. Let’s get into the day! I’m working on a couple of seasonal oatmeal recipes so I’ve been experimenting lately. This morning, I made a couple of final tweaks to my apple pie oatmeal (recipe coming this weekend) and it was delicious! I also had my usual giant cup of coffee (with peanut butter cup creamer) with my oatmeal and two glasses of water while making breakfast and packing my food for the day. I had made stuffed bell peppers for Saturday night’s dinner and brought one in along with a salad for my lunch. These stuffed peppers are so delicious and have a good amount of vegetables since there’s cauliflower in there instead of rice. It was a good thing i had those zucchini brownie because the only thing I brought in to eat before my workouts was a Larabar! Which is my usual pre-workout snack but I like to add in an apple too for Mondays since I don’t get home from spin class until almost 7 p.m. But with the brownies after lunch, the Larabar worked perfectly to keep me fueled during weights and spin class. And during my workouts, I was of course drinking Nuun. Today’s flavor was Lemon Lime and after drinking plain water all day long at work it was so nice to have some flavored water. By the time I got done with spin class, I had finsihed off the Nuun. There were some really tough climbing sections in today’s class that got my heart rate up fast and staying there! I always combine my post-workout and dinner into one meal on Mondays. I don’t get home from spin class until almost 7 p.m. so I’m pretty hungry by the time I get home and done shower. So the easiest way for me to get in a good ratio of carbs, protein and fats is a nice big smoothie bowl. 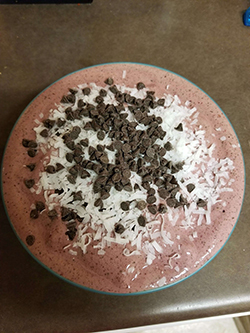 I had mixed frozen fruit, spinach and protein powder blended together for this one and then topped with mini chocolate chips and sweetened coconut flakes. After dinner, it was getting close to 8 p.m. So I settled in with Vinnie and my tea on the couch while Mike got in his workout at the apartment gym. Having a full day of work followed by some intense exercise really wears me out so I got my meditation in and was ready for bed by a little bit after 9 p.m.
For past several months, spin class has my favorite non-running cardio. Every single Monday at 5:30 p.m., I’m on that bike and pushing myself. But why do I love it so much? Even though spinning is a similar motion to running and hits the same muscles, there’s not the pounding that my body goes through with running. Because of this, I can still get in an intense cardio session and push myself while letting my legs recover from the past week’s mileage. Even after my high mileage weeks of marathon training, I could get in a spin class without causing injury. I leave every spin class sweating and with my heart pounding. Spin class pushes me in a different way than running does since there’s so many more changes the instructor can make during the class. Resistance goes up and down, there’s bursts of speed, we’re standing up, sitting down, moving forward and background. It all adds up to an intense cardio session (with the impact of running). George, my spin class instructor, is probably my favorite part of spin class. He does an awesome job of motivating and pushing the class which I need on some days. Plus, I don’t need to think about what’s coming up next because I have no control over it. George mixes up every class in what we are doing so it’s never boring and repetitive. I can tell my endurance has been built up since starting spin classes. I’m comfortable running about 25 miles a week without feeling extra soreness. Some of that might be coming off of two marathons in a row but I feel like adding spin class into my cardio routine has a lot to do with it too. Throughout this training cycle, I’ve been using the Nike Training Club (NTC) app every single week. I started off just using it for my core workouts and now I’m using it for my cross-training and occasionally yoga. And I’m loving it for mixing up my non-running workouts on the fly. Let me tell more about how I’m using it and why I’m loving it! But then you can filter even deeper in each category which is where this app really shines because you can get super specific in the workout level, equipment needed, intensity, type (rep or time based) and focus (strength, endurance or mobility). The one thing I wish you could filter down by is the type of equipment you have because “basic” equipment can mean anything from a yoga mat to dumbells to a plyo box. So there’s been times that I’ve though I found a great workout just to realize I don’t have the “basic equipment”. Lately though, I’ve been sticking to bodyweight workouts on the app (for both core and my strength training) and they are still really tough workouts (especially since I’m not used to bodyweight workouts). Plus I can take them anywhere and do them when I can fit them in without worrying about being near a gym. This was really great when we were traveling for Christmas and I just needed to get some type of workout in. I also like that I don’t need to set up a workout on my own and I can just pick from what I have already downloaded and go from there. I have a selection of ten or so different workouts already downloaded so I usually straight to there to star a workout. Of course, most of them are core workouts right now so I’m going to be trying out some different strength training workouts too. Have you tried the NTC app? Share your favorite workouts from it in the comments! Right now, mine are the Hip and Glute Strength and Super Twist Core Series.